Add another festival to Brisbane’s growing portfolio. 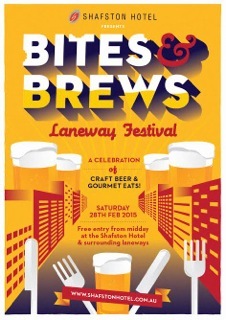 This Saturday, the Shafston Hotel in East Brisbane will be hosting its inaugural “Bites & Brews” Laneway Festival and it’s looking like it’ll be a good one. The outdoor event will be featuring some of Queensland’s top breweries, food trucks, and live local music. For those in the know, this Saturday also coincides with the Australia-wide “Craft Beer Rising” event which Bites & Brews is a part of. The Shafston is one of 6 listed venues here in Queensland for CBR, and it looks like they’ve hoarded some of the best of what we have to offer. The brewers list reads as a who’s-who of the big boys in good beer in Australia. Names like Feral, James Squire, Two Birds, Holgate, Mountain Goat, Little Creatures, 4 Pines, and Stone & Wood will be present, but what excites me is the local brewers that are also showcasing their wares. Fortitude Brewing, Newstead, and Green Beacon will have a presence and will be the showcasing our great local talent. All in all, more than 18 brewers will be on hand peddling both beer and ciders. Bites & Brews is also bringing on board some of Brisbane’s finest food trucks. Char Baby, King of the Wings, The Bun Mobile, and Chiptease are but a few of the names providing sustenance this Saturday. These trucks are tried, tested, and true when it comes to good tucker, and are known for matching very well with good beer. Those who frequent Green Beacon are familiar with their “Wing It Wednesdays” which feature King of the Wings, and The Bun Mobile has been known to park itself in front of the Scratch and The End to satisfy hungry patrons. Be sure to go down with an empty stomach. There will also be live performances from Pocket Love, Noah Slee, Tiana Khasi, DJ Cutloose, Gavin Boyd, and more to entertain you while you make your way through the various food and beverages booths. The blend of beer, food, and local music is what I’m looking forward to for this event. It’s a great way to highlight what Brisbane has to offer and expose a new crowd to the great scene we have here. 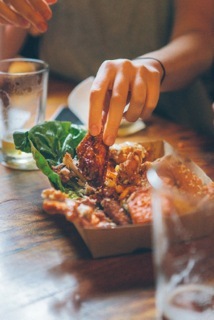 Bites & Brews Laneway Festival will be kicking off at noon on the Saturday and going until late. Entry does’t cost a thing, so be sure to arrive early. For more up-to-the-minute details as well as a full program, check out the Shafston’s Facebook page here. Sad that The Shaftston aren’t marketing the event as part of Craft Beer Rising though. I agree there. Maybe if I head down, I’ll push it.